Rachael will do anything to protect her bakery from the evil Bakermatic Baked Goods Company, but does that include murder? 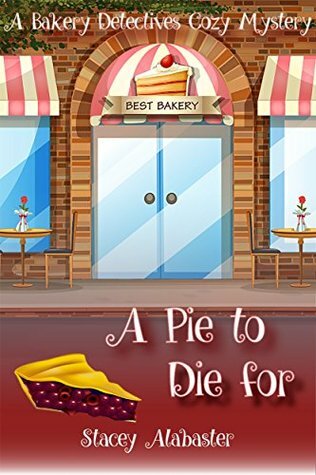 When a food critic dies after sampling a pie from Rachael’s Bakery, she is quickly labeled the prime suspect. When the police doubt her story of innocence, she has no choice but to find the real killer. With carefree best friend, Pippa, Rachael sets out on a mission to save her bakery, but it could ultimately cost her and her best friend everything. This is the first installment in the Bakery Detectives Cozy Mystery series. Each book is a stand alone story, but your enjoyment of each story will be increased if you read them all. Rachael has worked hard to get her bakery up and running and there is not much more that she wants than for it to be a success. But when a food critic continues to give her a hard time about her food, Rachael knows that may cause a problem for her dreams. When that same critic is found murdered after sampling a slice of one of her pies, Rachael’s problems just got a lot bigger. She decides that she needs to investigate the murder before she is imprisoned for a crime she did not commit. The characters are quirky and funny and a delight to get to know. Rachael is hard working as well as stubborn. When she gets an idea in her hed, it is hard for her to let it go. I really enjoyed Rachael and Pippa, Rachael’s good friend. The interactions between the two were funny to read about. The secondary characters brought more to life to the story and were good additions. The writing style flows smoothly and this book is a quick, easy read. The mystery is well crafted and carried on well throughout the book. There are enough suspects and twists and turns to keep the reader guessing and turning pages. I would recommend this book to anyone who enjoys a well crafted cozy mystery. I am looking forward to reading the other books in this series.